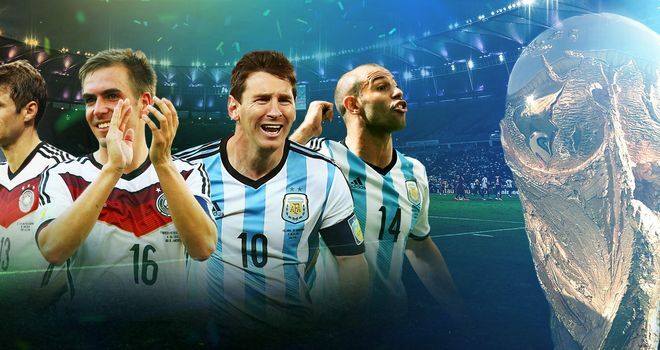 The 2014 World Cup final is upon us.. Regardless of what happened before, we know we can write history. Argentina duo Angel Di Maria and Sergio Aguero will be fit just in time for the game, however, Di Maria has only been featuring in some light training in the run up to the game, and will be probably have to settle for a place on the bench. Aguero is likely to come into the side in place of Lavezzi or Higuaín, but other than that we can expect to see a similar Argentina side to the one we saw against Holland. Germany manager Löw will also most likely pick a similar team to the one which destroyed hosts Brazil, but may choose to pick a little less attacking tactics – as Argentina are a massive step in quality to the team they embarrassed last Tuesday. So as a neutral who will you be supporting? I’ve thoroughly enjoyed watching Germany in this tournament and will adopt them as my team for the night. Don’t mean to make anyone jealous, but they are also my sweepstake team at work – so tonight I could be in the money! Thank you Brazil for hosting a wonderful tournament. It’s been an incredible month and one which many will be sad to see end. But me? I’m now far too excited that the domestic season is edging closer and closer to shed too many tears.